Marble Hill TW1 Rug Cleaning | RDA Cleaning & Maintenance Ltd.
Make sure to do everything necessary to maintain your stylish rugs in top condition. Naturally, the first thing you need to think about precisely is what is the most effective rug cleaning approach. Well, certainly it is not the one with materials at hand. Better, opt for professional rug cleaning services in Marble Hill TW1. Dry rug cleaning Marble Hill TW1 is a method created by the need to not ruin non-water resistant materials. When these materials get in contact with water they would usually expand or decrease which would result in the ruining of the look of our rugs. This method uses a special powder and spray like products. The process begins when our technicians inspect the fabrics of the rugs to determine exactly what type they are. Doing this they can determine precisely what detergents can be used. Pre-treatment is the next step where all dirt patches, high traffic areas and stains are treated with the proper detergents. Then it's time for the special absorbing powder. It is evenly applied on the entire surface of the rug. Then a special machine with lots of tiny brushes scrubs the powder deep into the fabrics. There it combines with all the dirt and grime and is later vacuumed off. Depending on the rug type you have, either deep dry or steam rug cleaning Marble Hill TW1 will be performed. Steam cleaning (also called hot water extraction) is done with a powerful professional hot water extraction machine. First, the rug is shampooed and then rinsed off. During the process, 95% of the water used is extracted back into the machine. This allows for quicker drying and less risk of ruining the rug and the floor beneath it. 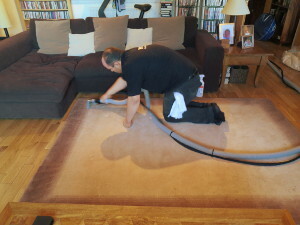 Why Hire RDA Cleaning & Maintenance Ltd.'s Rug Cleaners in Marble Hill TW1? Rug Cleaning TW1 Marble Hill Experts. Book Now! To book our deep rug cleaning Marble Hill TW1 service just contact our customer care centre at 020 3404 1646 or by completing our online contact form. The booking request will be processed as soon as possible, and within 2 hours, you will receive an SMS and e-mail confirming the booking. There is no deposit. You can book a deep rug cleaning for the same day or any other day of the year. Book more than 1 service at a time and get amazing discounts! Regular customers receive preferential prices.